Infrared Thermal Imaging allows us to see and measure heat. Infra-Red heat cannot be seen by an unaided human eye. From these images we can identify where heat is being lost from buildings and heat distribution systems. Removing unnecessary heat loss can significantly reduce energy costs. A thermal image makes it simpler to see where insulation is missing or air is leaking in or out of the building. Why have a Thermal Image Survey? 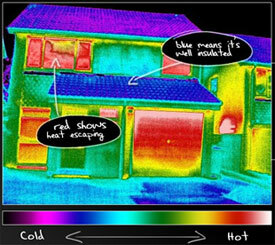 Heat losses, humidity and air leaks are instantly visible on colourful thermal images. To investigate causes of excessive condensation and areas of mould growth. To review operating efficiency of Heating, Ventilation and Air-Conditioning. Thermal imaging survey of radiators/under-floor heating to check for faults. Highlight how your house would fare if it were to get a Building Energy Rating (BER) by highlighting all the areas of your house that influence a BER.